Good news indeed. My girlfriend and I saw a fisher climbing up an embankment and entering the forest on the south side of the highway down from Mesa Falls, just a couple hundred yards or so below where Robinson Creek enters Warm River. I’ve seen martens too, and it definitely wasn’t a marten – darker, bigger, pointed tail not fluffy. Found a dead one near an abandoned 1903 Mormon Church in Porterville, Utah about 25 years ago. Why it would have been there is a mystery. Number of fishers: unknown. Number of fishers trapped unintentionally in MT: unknown. More than 60 of an unknown number killed as nontarget victims of traps in ID over 4 trapping seasons. Northern Rockies fishers are a distinct population segment. Habitat loss. Climate change. Geez! Let’s think about it some more. In late 2010 I saw the only fisher I’ve ever seen when we were out roaming the wilds. High in the Tetons, on a solo hike, I came virtually face-to-face with a marten (neither of us ran). One Thanksgiving, a long tailed weasel came rippling through the snow right up to our deck as we were putting up Christmas lights! In the Yellowstone backcountry near Heart Lake, I stood transfixed at a downed log, watching a short-tailed weasel go about his/her life. Have yet to see a wolverine…man, that’ll be a big day! We allow marten and fisher trapping in upper MI, even though it seems pretty ridiculous. Marten seems to still be maybe OK, maybe worrisome – take was increasing (increased number of trappers), but effort per animal flat, about 450/year in 2013. Fisher not – effort per animal had been increasing, but take was flat at best, about 250 per year. So we finally reduced to just one of either per trapper per year around 2012. Not enough data since then (no report from last winter out yet), but it might still be too many fishers being killed. Even a fisher pelt is only worth about 60$. That’s 15000$ of fishers total per year. Can we offer to outbid the trappers or pay them? Sadly every extra pelt is a bit of money to those trappers. At least one fisher in Montana was known and reported as “incidentally” trapped. At the end of 2014, it was killed in a conibear, body crushing quick kill, trap set for the much smaller pine marten. Both living in the same type habitat, that isn’t too surprising and both would be attracted to much the same bait. An average 60,000 wildlife are reported trapped and killed in Montana, annually. These do not include the “non-targets”, the “incidental and accidental” dead or released “unharmed”. The reports are predominantly from 1/3 of trapper’s voluntarily reporting. Only 5 of the 15 legally trapped species in Montana have to be reported. 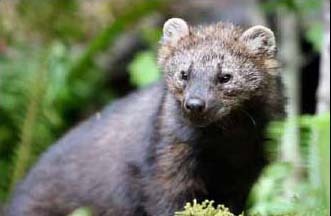 How many never get reported and why are animals, such as the rare Fisher, legally trapped in regions of Montana to begin with? The fact their pelts doubled in four years? Trapping is market driven. The fur demands from Russia and China have recently plummeted but we are yet to see a decline in trapper’s recreation. Some say they are just stockpiling their furs.